According to Wikipedia, “Trillium is a genus of perennial flowering plants native to temperate regions of North America and Asia.” They are distinctive plants as everything comes in threes – three leaves, thee calyces, and three petals. Flowers come in a variety of colours – red, purple, pink, white, yellow, or green. Being woodlanders, they enjoy a moist, humus-rich soil in part shade, conditions also enjoyed by slugs and snails who find them quite tasty. Deer are reported to enjoy them too. 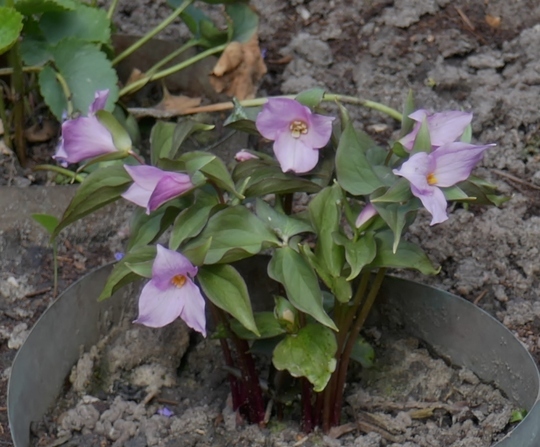 Due to the size of its flowers and its relative ease of cultivation, Trillium grandiflorum is one of the most popular and fairly readily avaiable to buy. Individual plants are about a foot across and slightly taller at maturity, and a large colony makes an impressive display (if your bank account will stand it). Although they can be grown from seed, this is a slow process with only roots produced in the first season, a single seed leaf in the second, and one true leaf in the third year. At best, it will be another two or three years before flowering size is reached. An alternative method of propogation is by dividing the rhizome, but each part must have a growth bud, and the cut faces treated to prevent fungal infection. The flowers of T. grandiflorum are white, sometimes taking on pink hues as they age. But there is a very choice form sometimes available, T. g. ‘Gothenburg Pink’, where the flowers are pink right from the time they open. In the 1950, Gotherburg Botanic Garden in Sweden received a pink form from their counterpart in Edinburgh, which only could be multiply by divisions since the seeds gave both pink and white forms. In 1995, the garden received two pink forms from a couple in America who had photographed all their native trilliums in the wild, and who grew and bred the plants in their own garden. The Swedes started to hand-pollinate the pink forms and in the year 2000, all the seedlings came out true pink and continue to do so to this day. Whether you prefer your trilliums with white or pink flowers, they are a great addition to a woodland garden. I love these plants. I have one T grandiflorum in flower, not sure what has happened to the other 3 though. I also have T luteum in leaf but no flowers. I have lost count of the ones I have tried to grow in the past. I love this lovely pink form Andrew. Love the pink form, but my pocket money wouldn't stretch to one! I've never seen this color before. Thanks for sharing! I like the pink too but they are all lovely.